We tend to take for granted any pleasure, however acute, that is offered to us regularly; the gift becomes routine. Only when it's removed do we realize how precious it was. And if, in some real-life Hollywood ending, the gift is restored, we can again savor the privilege, this time more acutely. Roger Ebert, who's 65 this week, began writing on movies 40 years ago, mainly as a critic for the Chicago Sun-Times, but syndicated to some 200 newspapers. He's created a body of work  virtually all of it available on his handsome, helpful website  that is as broad, deep, reliable and rewarding as it is insanely prolific. I'll take a blind stab and say Roger has written more than 10,000 individual movie reviews, plus another 3,000 or so essays. Many of these have been collected into his 40-plus books on film. But on this five-foot shelf there are also an Ebert novel, Behind the Phantom's Mask (begun as a weekly newspaper serial); a travel book, Perfect London Walk, written with Daniel Curley; The Computer Insectiary: A Field Guide to Viruses, Bugs, Worms, Trojan Horses, and Other Stuff That Will Eat Your Programs and Rot Your Brain, co-authored with John Kratz; and at least five other books to which Roger has penned introductions. There's no writer's block for this perpetual scribe; he's never missed a deadline. I'll bet that if Roger had written this tribute, he would have finished it in time for his actual birthday, which was Monday. To all this he's added what people may think is his main job: being a TV host, fronting series of weekly movie-review shows since 1976, first with Gene Siskel, then with Richard Roeper. He's also recorded commentaries for DVD releases of classic films, from Citizen Kane to Beyond the Valley of the Dolls, the sleazerrific Russ Meyer movie that Roger co-wrote in his 20s. As the go-to movie savant, he's been on hundreds of TV shows, sometimes alone, sometimes with his review-show partners; who can forget that night in the '80s when David Letterman persuaded Roger and Gene to toss basketballs at a makeshift hoop? And there've been countless speaking engagements, most of them to proselytize for the art and pleasure of movies. At some of these events he leads an in-depth discussion of some classic film  Citizen Kane, Vertigo, The Third Man and most recently In Cold Blood  stopping the action to analyze each frame and study the elements that contribute to the best movies. 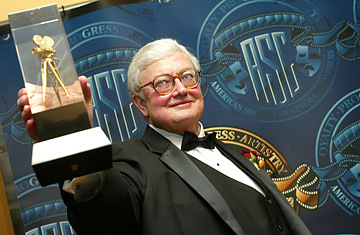 Indeed, he's done so much that I sometimes suspect there's more than one Roger Ebert. And now I may have proof. The Amazon sites in the U.S., France, Japan and China list Roger Ebert as the author of a German economics treatise, Die Zustandigkeit Der Tarifvertragsparteien Zum Abschlub Von Verbands- Und Firmentarifvertrag (which translates as "The competence of the Rate of Collective Agreements to the conclusion of federation and firm collective agreements"). Roger is expert in many fields, but Ebert could be someone else. Last June, Roger's Nile or Niagara of words stopped, as he directed his energy to fighting complications of cancer of the salivary gland that had been troubling him for a few years. He spent a lot of time being treated in hospitals and recovering at home. Last month he missed his first Cannes Film Festival in, I'm guessing, 30 years. But in late April he did show up, resolute and cheerful, at the Roger Ebert Overlooked Film Festival  yes, he also runs his own Ebertfest, or uberfest  at his alma mater, the University of Illinois at Urbana-Champaign, flanked by his brilliant, loving attorney-wife Chaz Hammelsmith and surrounded by a thousand well-wishers. His appearance had changed, but, he wrote on his website, "I still have my brain and my typing fingers." And now he's using them, hurrah hurrah, to produce reviews. He's covered mainstream movies like Shrek the Third and Bug, and artier fare on the order of Guy Maddin's Brand Upon the Brain and Hal Hartley's Fay Grim. Today he has a review of A Mighty Heart. It's a phrase that certainly applies to Roger, and Chaz too, for their year-long battle against his debilitating illness. With open arms ready to embrace a trusted friend  which Roger has been to Mary C. and me for three decades, and is to any reader or viewer of his work  we can say: He's back!